The manner of acting, feeling or thinking that shows one's disposition, mood and mental set. We sometimes say someone has an attitude. We mean he has a quarrelsome or sullen disposition or temperament, or is haughty. These dictionary meanings are summarized by one verse, Proverbs 23:7, "As [a person] thinks in his heart, so is he." The Bible is full of examples of both good and bad attitudes-attitudes that turn people toward the things of God and also attitudes that turn people away from the things of God. 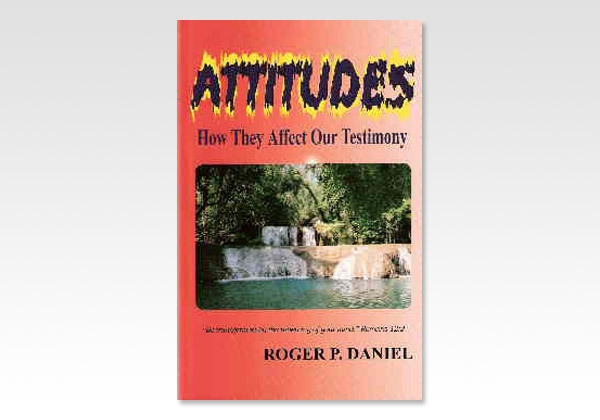 In this little book Roger Daniel summarizes some of especially New Testament examples of both good and bad attitudes. Thus we may look at ourselves and determine whether we are pleasing or displeasing the Lord in how we are acting, whether at home, work, school, or in the local church. Since Satan so successfully uses our attitudes to his advantage, we suggest you prayerfully study these examples, not thinking about the other people you know, but about yourself! Roger Daniel is a married, retired engineer with two grown children. He writes with an engineer's carefulness and clarity. He has been writing for younger people for over 50 years, and has a number of books published by Believers Bookshelf, Inc.